What is Dogtra No Bark Vibrating Collar? The Dogtra No Bark Vibrating Collar trains your dog to stop unwanted barking. The low-to-medium power unit vibrates before any correction, allowing your dog to learn faster and with less stimulation. The unit features two options for training: 10 levels of stimulation and a vibration-only mode. The unit has plastic contact points, making it a great option for pets with steel allergies or sensitive skin. The waterproof unit contains a reduced size receiver and is ergonomically designed for a better fit and to reduce pressure. The Dogtra No Bark Vibrating Collar automatically detects when your dog barks and emits a vibration, simulation, or both to your dog to correct the unwanted behavior. Your dog will learn to stop barking to avoid the stimulation. For use on dogs only. It is recommended to begin training at the lowest level. Gradually increase intensity if your dog continues to bark. Closely monitor your dog's reaction to find the correct stimulation level. For in-depth installation details, please read the Dogtra No Bark Vibrating Collar. Installing collar strap: Make sure the collar is turned off. Insert the collar into the collar strap with the intensity dial going in first. Next, pull the collar strap from the opposite side of the intensity dial over the rest of the body. Be sure that the strap is wrapped fully around the body of the collar. Testing the collar: Turn the intensity dial to (T) for the test mode. The LED indicator will flash once. After 2 seconds, it will continue to flash every 2 seconds. Activate the collar by making sounds directly into the microphone. The unit should vibrate twice. Repeat the test once more after 15 seconds to verify that it is fully functional. 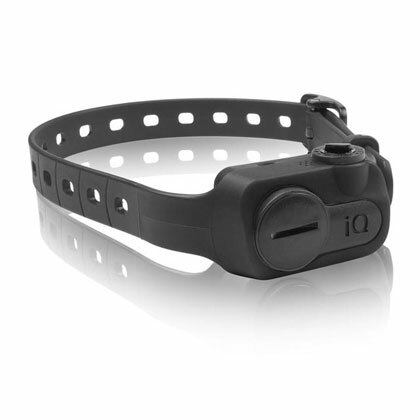 Pager/Vibration mode: The collar will vibrate twice when your dog barks. Stimulation mode: The intensity levels range from 1 to 10, with 1 being the lowest level and 10 the highest level. It is recommended to begin training at the lowest level. Gradually increase intensity if your dog continues to bark. Closely monitor your dog's reaction to find the correct stimulation level. A proper fit is necessary for optimal functionality. Both contact points must be in contact with your dogs' skin at all times for a consistent stimulation. Remove the collar before playing with your dog. The activity may cause your dog to bark, which may lead him/her to associate playing with the electrical stimulation. Move the contact points to a different location on your dog's neck periodically to avoid skin irritation.